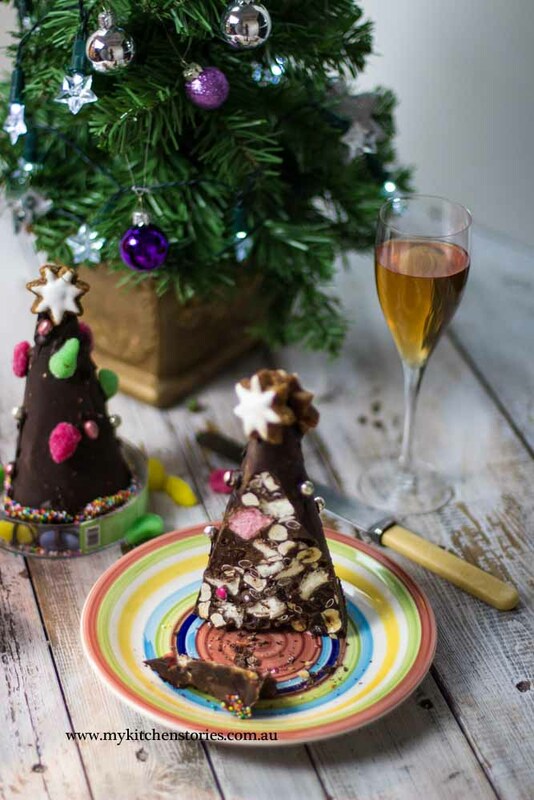 Chocolate Rocky Road Christmas Trees? What a great idea! I made two different designs (and sizes) just to test it out. These look good on a Christmas table but they are also really good when you have visitors because they are really just a nice little bit of a treat with a cup of tea or coffee. They keep best somewhere a bit cool and in an airtight container or shrouded in cling wrap just to keep the nasties out. They keep in the fridge too but the chocolate gets condensation on it when you bring it out. That’s not ideal because it discolours. So somewhere cool is best. 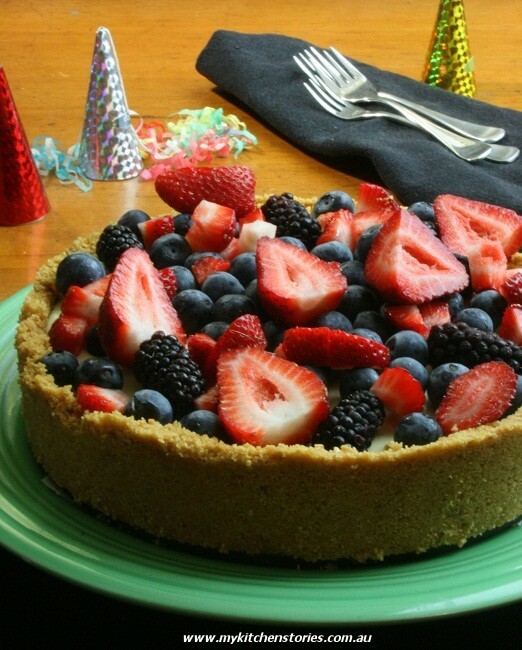 You can decorate them in any number of ways. After they are set, and taken out of the mould all you need to do is melt some extra chocolate and stick on whatever you like using the chocolate as glue. Dip them in hundreds and thousands or whatever you like. I have used some lovely gingerbread star cookies for the top but you could use whatever you like. I am not sure there is much more I need to say about this except hope this makes someone happy. Maybe leave one out for Santa? 1 packet Candies - whatever you like. 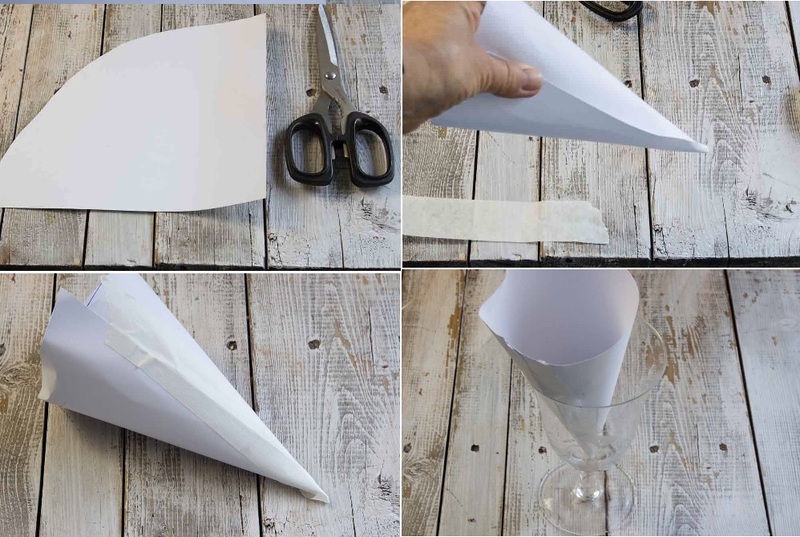 Using a firm piece of paper or cardboard make a cone by cutting out a semi circle or the corner of the cardboard and rolling it into a cone. Secure with tape. Just make sure the tip doesn't have a gap as this will allow chocolate to leak from the bottom. Sit it upright in a mug or a glass and set aside. 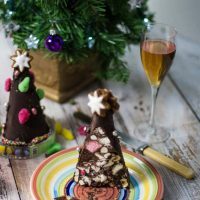 Put all of the filling ingredients except the melted chocolate into a bowl and combine well. Add them to the chocolate and stir till just combined. Spoon the chocolate mixture into your mould. 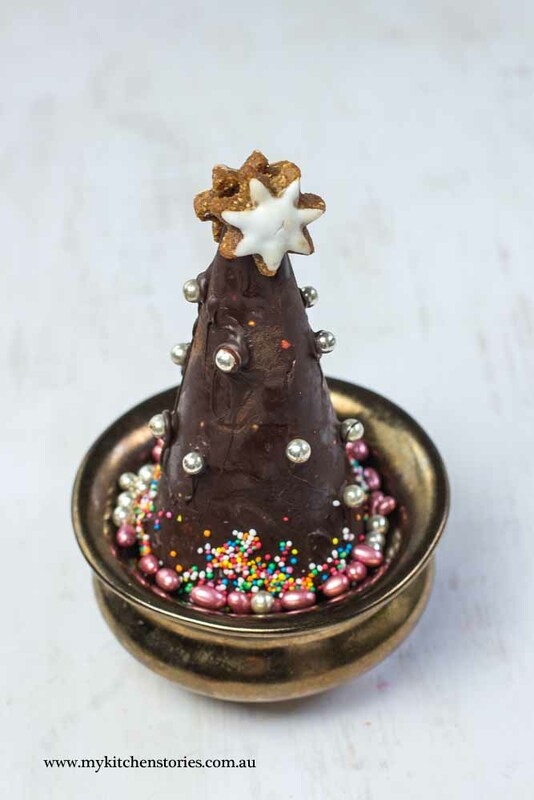 Starting with a little of the chocolate without bits if you can and drizzle into the point. Then add the rest of the mixture pushing down gently so there are no spaces. try to make the surface flat and even to save cutting and evening it later. Refrigerate till firm standing in the cup or glass, overnight in the refrigerator is best. You can then unmould your tree and discard the cardboard. You may need to even out the base so it stands straight. Do this by laying on a chopping board and cutting off any bits that are uneven. Eat them. Melt the extra chocolate and let it cool down till it is just starting to set around the edges. This makes it easier to use. 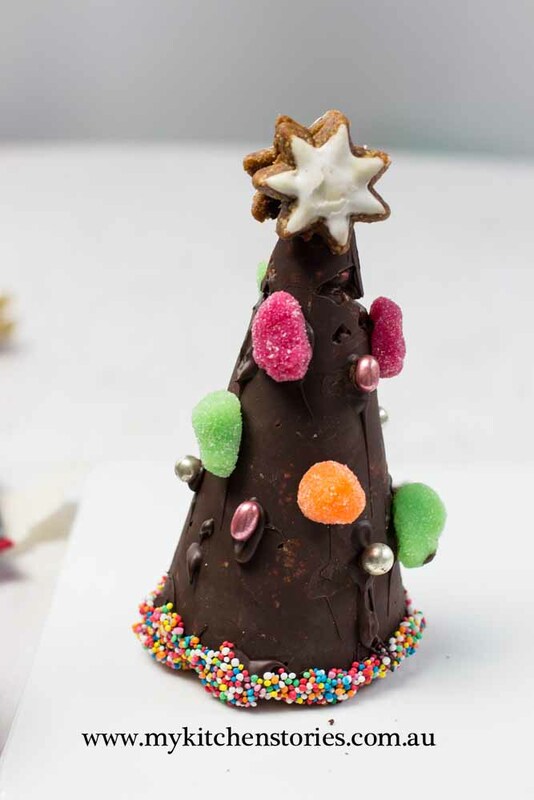 Use the end of a teaspoon or a tooth pick to apply the chocolate and stick your decorations on. Your tree will keep at room temperature in a cool place till needed. A container with a lid or a plastic bag over the top will protect it. 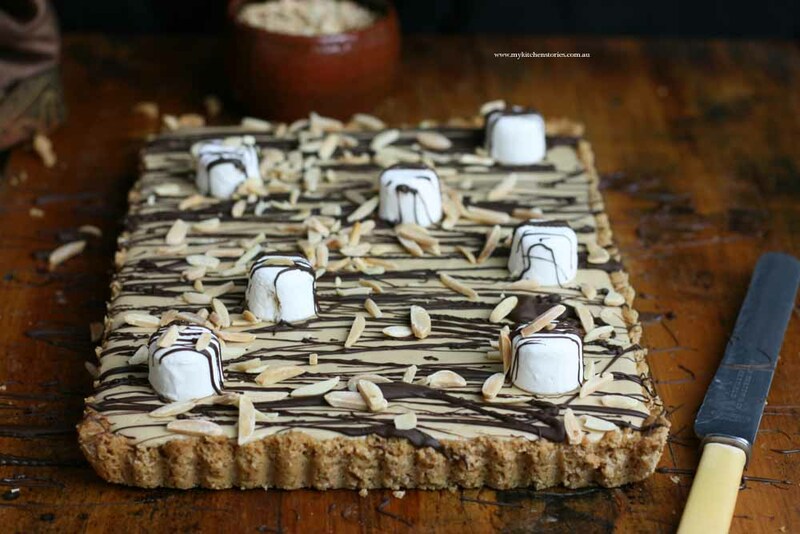 No Bake Marshmallow Chocolate tart. Click on the picture for the link. Such a clever and fun idea! Happy Holidays, Tania! as cute and clever as they are delicious! 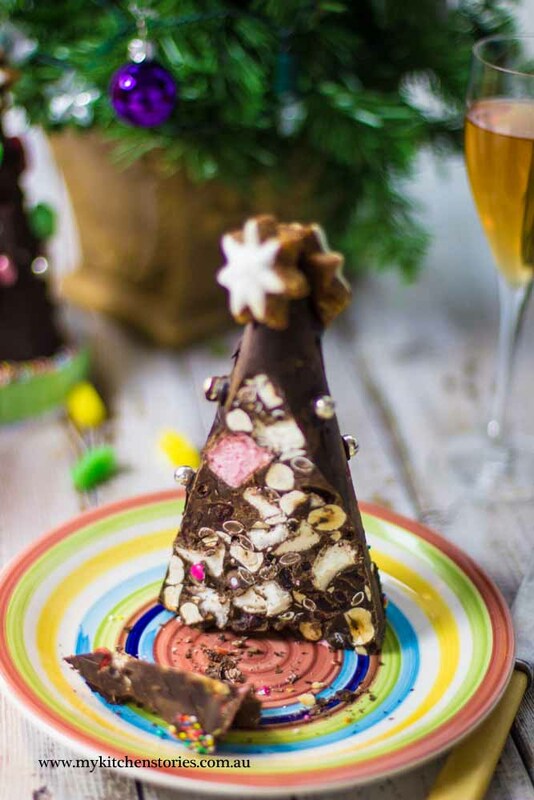 I did this once using ice cream cones and I smothered the outside with chocolate. I love the way you’ve decorated yours. 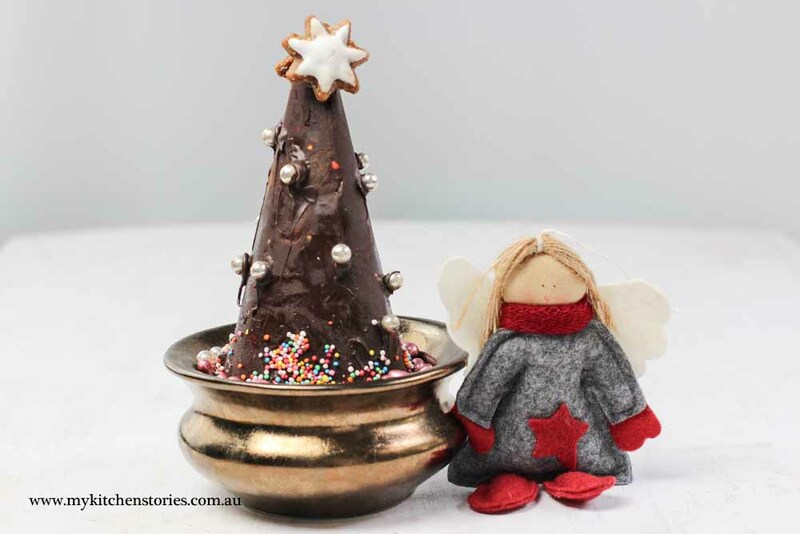 What a gorgeous clever Christmas idea! Thanks Lorraine and Merry Christmas to you too!